Coming from the Boston area, we have a pretty decent aquarium right in our backyard (the New England Aquarium) so any new aquariums have a high bar set for them. The South Carolina Aquarium did not disappoint us and we enjoyed a fun morning exploring its exhibits. 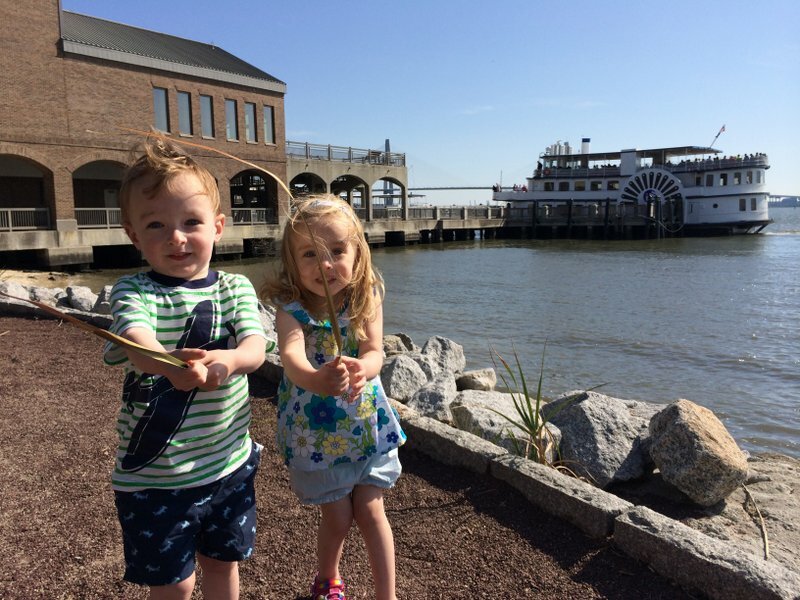 The aquarium is located on the waterfront adjacent to the Fort Sumter ferry terminal. It’s two stories with a variety of exhibits focusing heavily on local animals and habitats. Interestingly the exhibits featured many animals not typically associated with aquariums like birds, reptiles, and even lemurs! 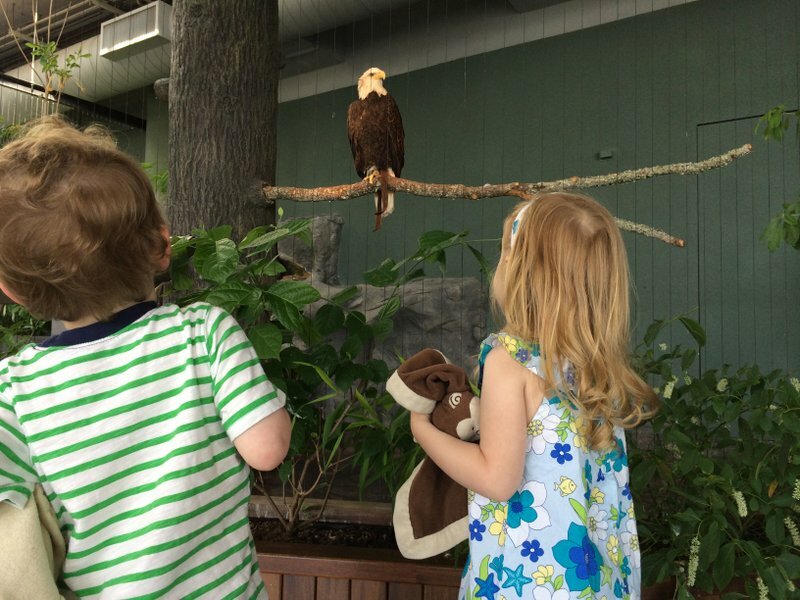 Shortly after entering the building and going up to the top level we found a live bald eagle (yes, an eagle at an aquarium… this was just one of many bird species on display throughout the facility). The majestic bird was sitting on a branch behind a thin wire containment which made for easy viewing. 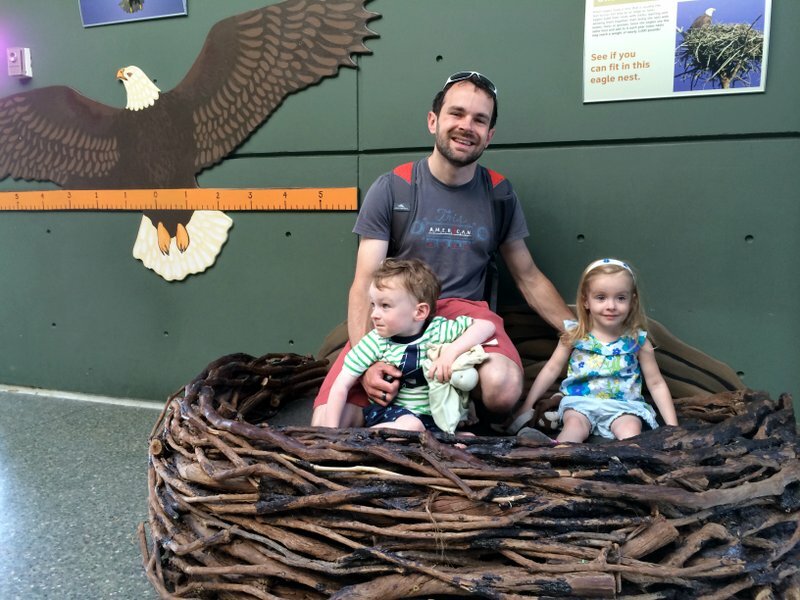 There was even a life size eagle nest replica which of course we climbed into (there was a sign inviting us to try)! After getting in touch with our inner eagle we spent some time at a fun sensory table area with shells, seaweed, and a variety of horseshoe crab shells. Just around the corner from the sensory area is one of the highlights of the aquarium: an enormous albino alligator! The tank is floor to ceiling and you can walk right up, getting a face to face view of this very impressive animal. I was apparently so awestruck that I forgot to take a picture! It was not far to the next highlight: a terrific outdoor space with a ray tank that had large windows down to floor-level so little ones can see through easily. This outdoor space also includes several large birds like herons and pelicans who enjoy awesome views of the harbor from their perches around the perimeter of the exhibit. 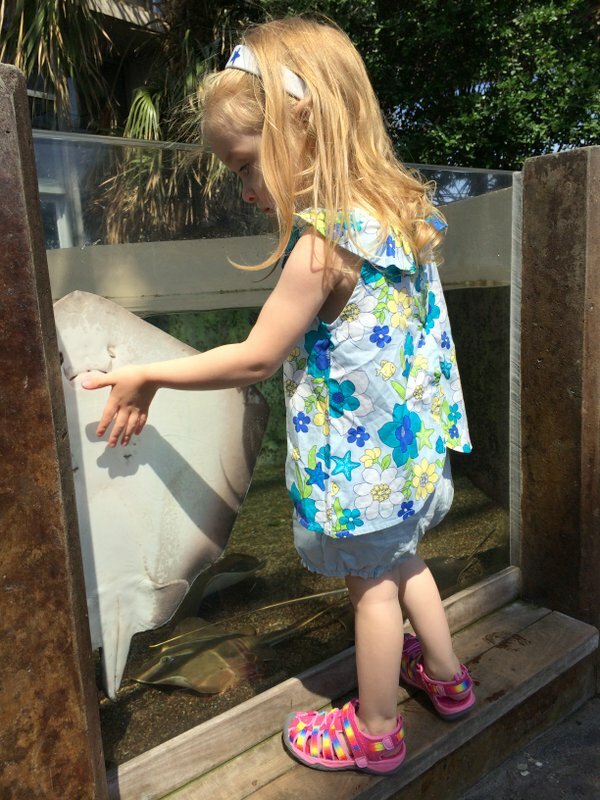 The South Carolina Aquarium features a huge multi-story tank with schools of enormous fish including several sharks. There’s one particular viewing area where the glass slopes towards you – we sat on the floor here close to the glass for quite a while, feeling almost like we were in the tank with the fish. Nearby there is an interactive touch tank with star fish, urchins, and rays (though the rays were hard for our 3-year olds to reach due to the depth of the water). The attendant here was super helpful, even putting a star fish into a smaller bowl with some water so Jasper and Aurora could see it up close without having to reach in up to their shoulders in the main tank. 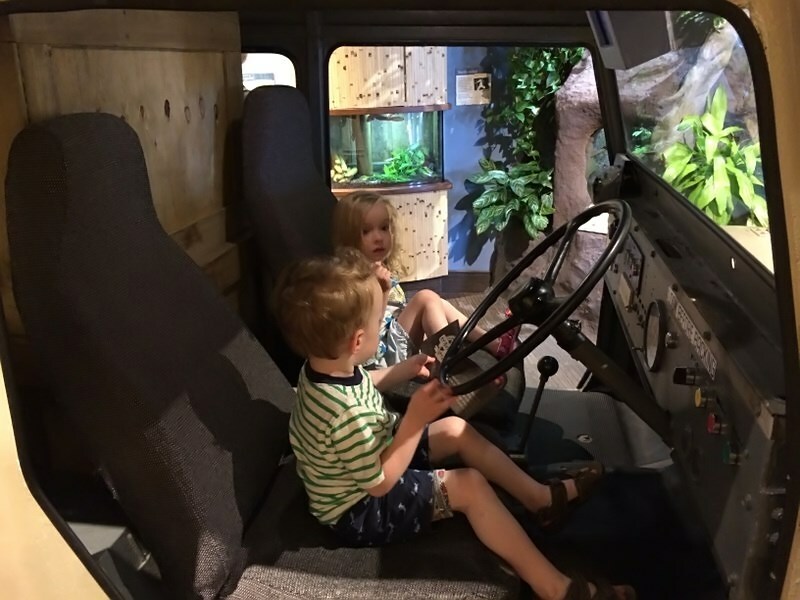 On the first floor there is a Madagascar exhibit with lemurs, a variety of other small animals and plants, and a safari jeep that kids can climb into, pretend to drive, and tune the radio. Tucked in the back of this area is a toddler play area with a small playhouse and slide. Be sure to check out the “passport” game in this area as well. Kids can pick up a paper passport and stamp it at each of the four zones within the exhibit. The stamps are actually embossed into the passport which was a lot of fun. 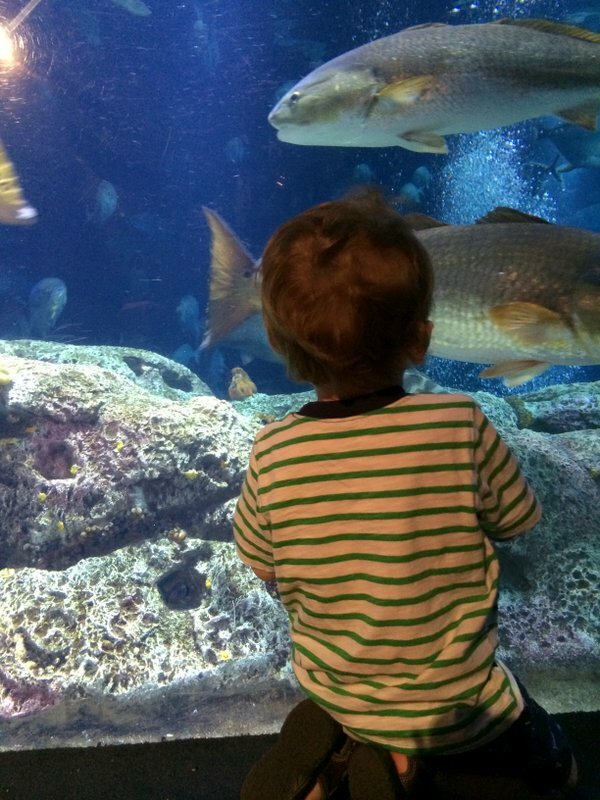 The aquarium is a good place to keep in mind if you need something to do in Charleston on a rainy day or super hot day. We lucked out with perfect weather during our trip but having a few indoor activities in your back pocket is smart, especially when visiting a place like Charleston where so many of the activities are outdoors – like gardens, plantations, parks, and city exploration. Hours: 9am – 5pm in summer, 9am – 4pm in winter; additional details, including holiday info on the aquarium website. Cost: $25 for adults, $18 for kids 3-12 aquarium only; $30/$23 adults/kids includes “4D” theatre; kids under 3 are free; details on the aquarium website. Tip: we found a coupon for a couple dollars off the adult admission in one of the local tourist magazines (we picked up a copy at our hotel), so you may be able to find something similar during your visit. Time: We spent about 3 hours walking around and that seemed like a good amount of time. We didn’t see the “4D” movie but otherwise went through most of the exhibits and didn’t feel rushed. Food: We didn’t eat at the aquarium itself and instead went around the corner to East Bay Deli (entrances on both Washington and East Bay Streets). We had some delicious, huge sandwiches at an outdoor table. The only downside was the long lunchtime line, which at least tells us it’s popular! Getting There: We drove to the aquarium and parked in the large garage across the street (corner of Concord and Calhoun Streets). The garage cost $1/half hour like most others in Charleston. Check out the map below or find additional info on the aquarium website.